Follow me as I complete my Tactical Machining 1911 80% build project! 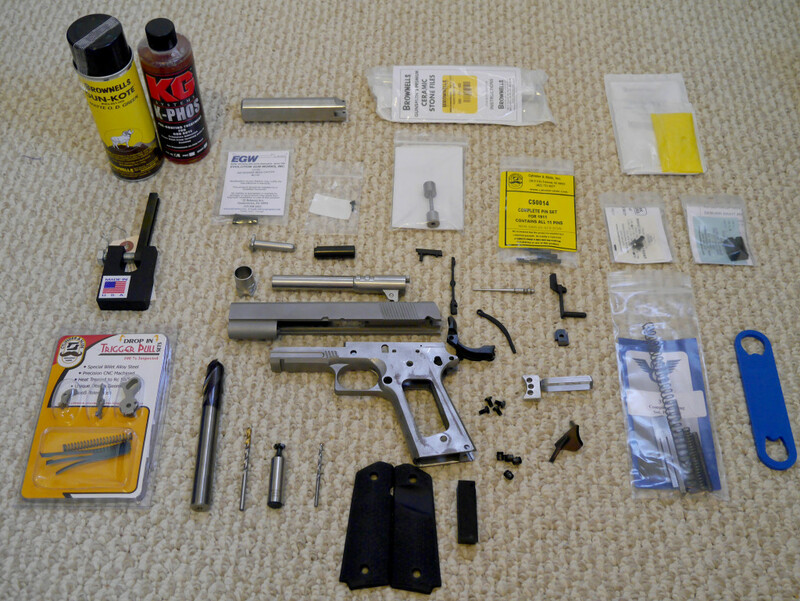 I make it easy to follow so you can make your own 1911 at home. I start off with how to get the “paperweights” and jigs. Then I go over my tooling setup and parts list. Then finally I dive into actually getting the receiver to 100% and assembling/fitting the rest of the 1911. Disclaimer of course. Edit: Just finished my TM build (still need the sights). First, you’ve got to actually get the 80% and the jig which allows you to easily finish the receiver. I was lucky and got their first batch of 80%-ers in June 2014. Their jigs just came out July and I was able to snag one with the help of a Chrome extension called Page Monitor. Just choose the 80% Page page, set the refresh rate to whatever, and choose some sort of notification of when the page changes. Edit (Jan 27, 2016): TM still has some trouble keeping their 80%-ers in stock, but good news is that there’s a lot more providers now. I’ve only done my project with Tactical Machining’s but here are other potentials. There are slight differences in what you have to do to get it to 100%, but my guide should still be very useful. Hello, I’m going in a little blind to this build. I have a frame for a 1911, (recieved from a friend who abandoned the build.) and do not know what size it is. ie Full size, Commander. How would I measure to determine what I have? I know that I need to mill the slide rail as well. Is there any way or pictures I can look up to find out if there is anything else I have to mill out? Any information would be useful so I can get the right jigs. Thank You. can you post 360 degree pictures of the 1911? mainly the back face, is it smooth or is there slide over hang (back face of the slide hangs over rear of the frame)? did you have to blend the slide to the frame? Hi Chris, mine has some minor overhang (.04″). I had it looked over and test-fired by a gunsmith who said it was merely cosmetic. I’m going to just leave it and not blend since it doesn’t bother me. I’ll post up more pics after I put on the sights. If yours is not flush, I’d have it looked over by a smith (which is a good idea at the end to do anyway). Did u get the pistol sse’d (single shot exemption)? Hi Chris, I’m in CA so I went with the SSE route when building (longer barrel, overall length, etc). I also stamped in a serial so my smith would look at it. 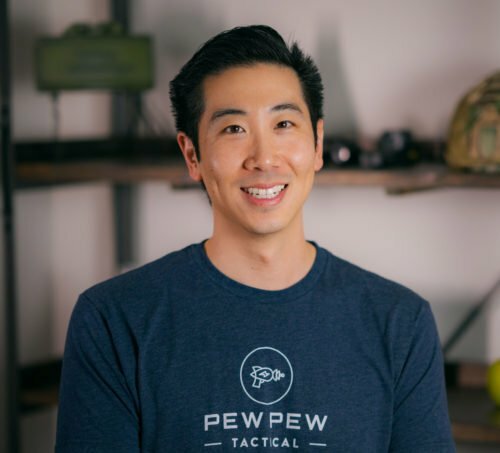 Just search/post on Calguns since I’m not the expert in this area. I live in CA aswell. Where did you purchase your sse kit? Also what did you use to serialize the frame?Thanks! I borrowed my friends kit. I believe he got it here. You can call around stores on this list to see if they borrow. For serialization, I got the Tekton Letter/Number Stamp Set. 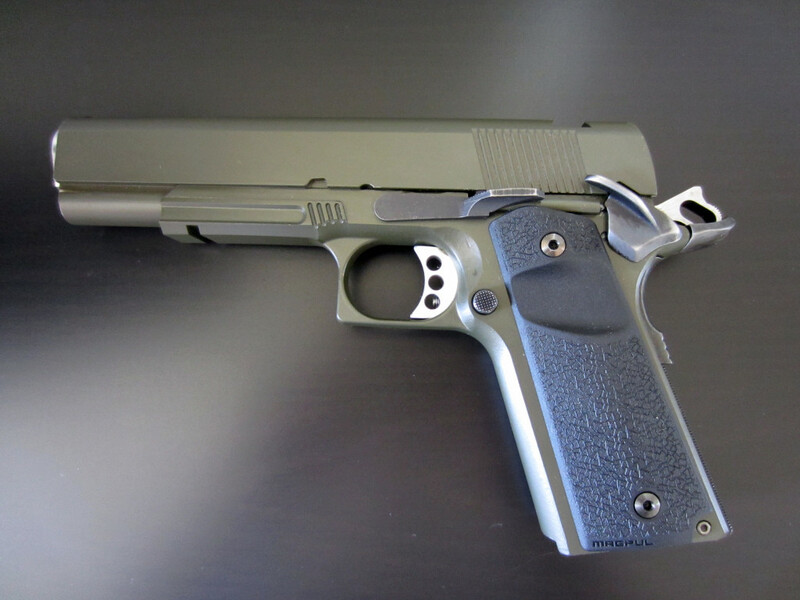 What an impressive finish on this 1911. I really appreciate your sharing your experience with us. You have answered a lot of questions I have had. I hope I can turn out something that is close to as nice as your pistol looks. Hi Dan, glad to have helped! Let me know how yours turns out.